The G2BP measures 2 5/8" x 1 7/8" x 10 3/4" and has an adorable brown with pink dots print on the top and bottom of the bag. 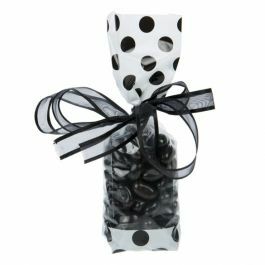 This printed gusset favor bag is perfect for holding candy, popcorn, chocolates, party favors and more. Accessorize with ribbons or bows. This bag is 1.6 mil thick and laminated for durability. Heat sealable. This gusset favor bag is designed with a chocolate brown with pink dots combination print. Ideal for treats and gifts, the G2BP measures 2 5/8" x 1 7/8" x 10 3/4" and is an excellent fit for chocolate, popcorn, confections, candy, toys, and crafts. This slender bag is also an excellent option for packaging cosmetics and beauty products. Expanding side gussets make room for bulky items while the bottom is sealed for extra durability. The material is 1.6 mil thick and laminated for an exceptional presentation. Dress up and seal this bag with ribbons, twist ties, or bows. For a more secure closure, this bag can be heat sealed with a standard hand sealer. Outer Dimensions: 2 5/8" x 1 7/8" x 10 3/4"